Blog > Beyond the Backyard > Viera Wetlands is Open Again! Viera Wetlands has been closed since Hurricane Irma. It recently re-opened and I headed over there to see if I could ease the pangs of my Lake Apopka Wildlife Drive withdrawal. It felt great to be out again but the wetlands were not particularly active. The vegetation has grown up and filled in places that used to be prime duck-watching locations. The Great Blue Herons are starting to nest in the tops of palm trees. If I get there before sunrise, I usually head to the center of the wetlands to photograph the heron silhouettes against the orange sky. The heron on the right was alone on the nest for a long time. When I saw her stand up and arch her neck, I knew her mate was about to fly in. I love how the detail in their feathers is accentuated in this image. After the sun got too high in the sky for heron silhouettes, I turned around and looked for birds posing in the beautiful golden light. 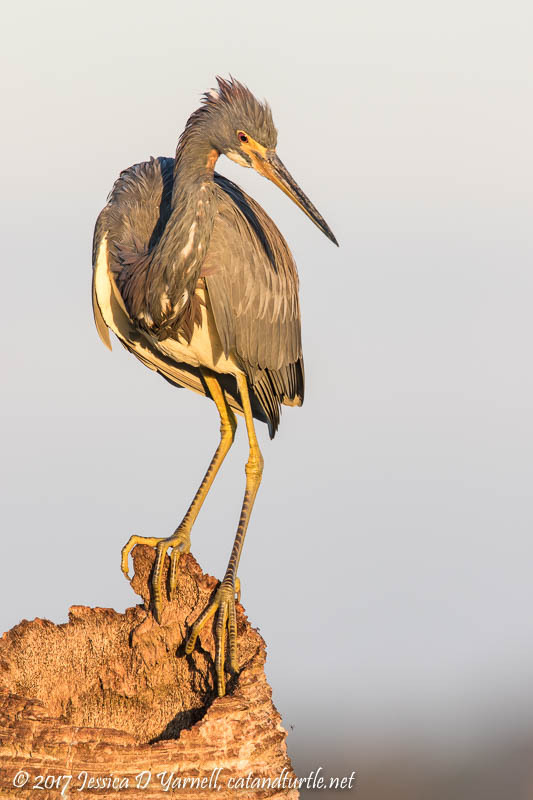 Wading birds like this Tricolored Heron flew to the tops of dead palm trunks, posed briefly, and then flew off squawking in their quest for breakfast. 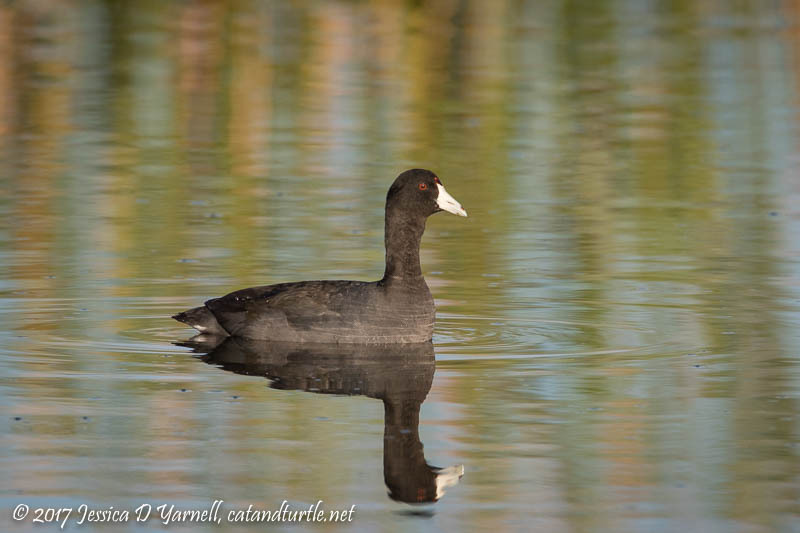 Who can resist photographing a first-of-fall coot? They are the harbingers of a great Floridan winter birding season! 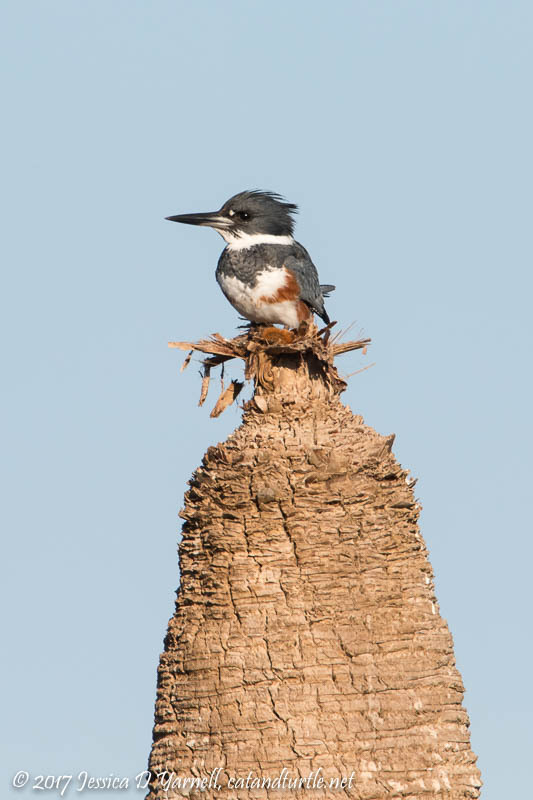 The wetlands were alive with the calls of birds, particularly this Belted Kingfisher, who was on the prowl for breakfast. She flew from treetop to treetop, watching the water below her. When the conditions were right, she flew out and hovered over the water, then dove straight down to grab her prey. Silly bird, she always took her fish to a far-off tree to eat it. But she did perch close enough for me to take her picture. The Great Blue Herons are not the only birds with nesting on the mind. 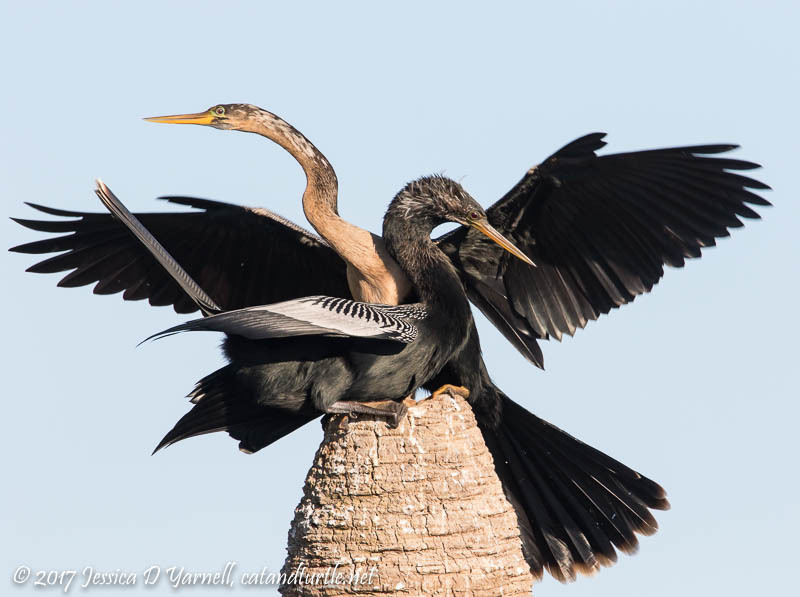 The Anhingas are starting to stake out nesting sites on the tops of dead palm trees, too. This pair was fun to watch as they defended their location. Want to see what happens when the male is sitting on the tree trunk and the female decides to visit? Lots of flapping wings…I was surprised they didn’t knock each other off! 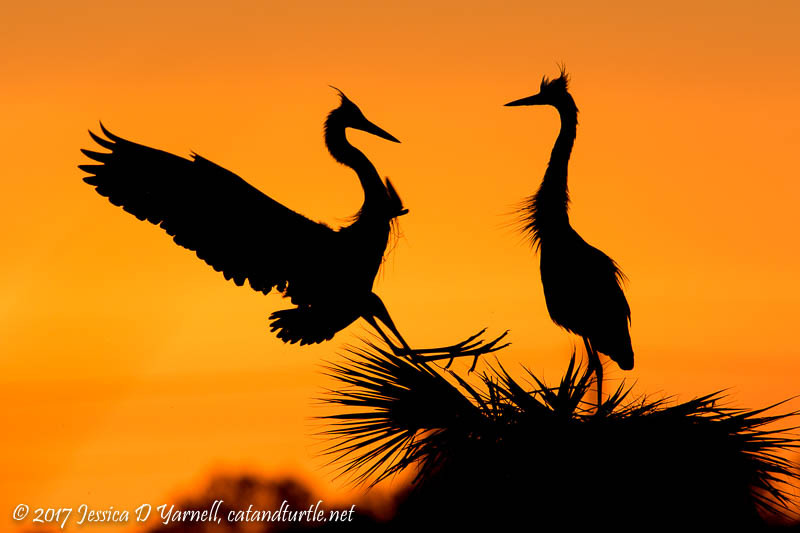 Superb silhouette of the herons! Viera is a great place. Hope to get over there soon. I’m always amazed at how big birds such as Anhingas try to fit onto a small perch!